While wearing pads has never been popular among skateboarders, back in the 80's there was no question that the grown-up part of the industry wanted you to wear safety equipment, and the big vert pros were always seen in at least knee pads. Particularly since in those days they were probably riding on a sketchy backyard ramp which may or may not be shedding nails and plywood splinters. Since the 1990's street has been dominant, and in particular, slickly edited video has become the defining medium. Street pros are essentially stuntmen in plotless movies, and they can no more wear a helmet than Jackie Chan can. To wear a helmet while boardsliding down a 15 step handrail simply misses the point entirely. The upshot of this is that it can be difficult to even find skateboard pads today -- you can literally go to multiple skate shops and only find a few odds and ends. Similarly, there's not a lot of commentary on the various options and their merits, especially for anything other than top of the line big transition pads. 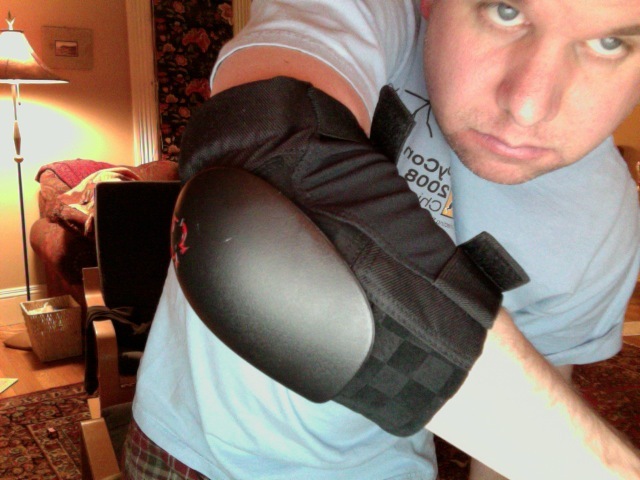 So, with that overly long prelude, here is my initial review of my new elbow pads. Low-end pads for people and institutions that just want something cheap. These pads seem reasonably functional; the basic design of a hard-cap skate pad is well understood by now. The high-end big vert pads: Pain Cheaters, Pro-Designed, 187, Smith, etc. Mid-priced low-profile pads: this seems to be Pro-Tec's market niche. I'm just going to be skating 4" transition, but I've convinced myself I could break my elbow pretty easily in the process without some protection. On the other hand, if I end up armoring up for the local park like I'm getting ready to jump a mega-ramp, I'll be much more likely to decide I look silly, getting too hot, don't really need pads, etc. The best pad is the one you'll wear. So I fit into the third part of the market above. I'll pay a little more for a comfortable, low-profile pad that should bail me out of the relatively low-intensity messes I'll be getting into. So... I ordered some Pro-Tec Double Down elbow pads, and yes, they seem like exactly what I had in mind. Part of the reason I've written this overly long, rambling review is that Pro-Tec's positioning of the Drop-In line is inconsistent. Occasionally they make it sound like this is their hard-core vert line. It really isn't, at least for the elbow pads. On the other hand, they're well made, nice fabric, fit the contour of your elbow well, good cap coverage, and still can easily be worn under a sweatshirt if you want. My initial impression is very good. Now I just have to slam onto one and see if they do their job. Unfortunately, we'll have to wait for this foot of snow to melt first.